In engaging anecdotes, Carol discusses her remarkable friendships with stars such at Jimmy Stewart, Lucille Ball, Cary Grant, and Julie Andrews; the background behind famous scenes, like the moment she swept down the stairs in her curtain-rod dress in the legendary “Went With the Wind” skit; and things that would happen only to Carol--the prank with Julie Andrews that went wrong in front of the First Lady; the famous Tarzan Yell that saved her during a mugging; and the time she faked a wooden leg to get served in a famous ice cream emporium. Loved the show! The only show I can watch over and over. I read the book a few years ago. This is my first audio book ever. I enjoyed just listening to Carol Burnett's voice. Love carol Burnett is such a joy, the years of the gift of laughter. Thank you Carol Burnett for making this book. I loved her show and think she is very funny but this book is more of a Guess you had to be there type of book. This is one of the most wonderful books I have listened to in a long while. Carol Burnett is a gift to the world and certainly an icon not only for her talent, but for who she is as a person. She has opened so many avenues for women and in comedy, film, business and life. She shares experiences, both great and tragic and always with love, grace and respect. I know I have learned not just only to appreciate comedy, but to be true to who you are from growing up watching her. This is a fabulous listen and my only disappointment was when it ended. This should be on everyones rental list. 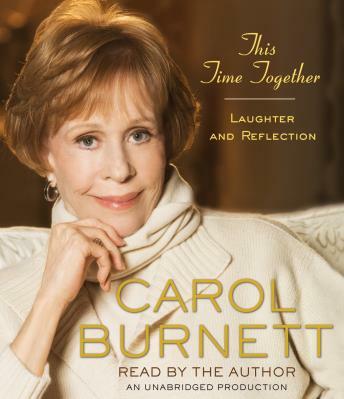 If you like Carol Burnett, you will enjoy this book. I have fond memories of watching the Carol Burnett show when I was growing up. It was great to hear the inside scoop.